Every Sunday morning I awaken at dawn to the sound of my precious children…screaming at me to make them pancakes. Kids go freaking psycho for pancakes and rightly so, in the end they’re really just bread topped with butter and sugar sauce so it makes sense. I thought about this as I watched my seven year old eat his flapjacks last Sunday. He devoured two in about 30 seconds, and then it just got out of control from there. I think he had 12 in the end, I’m not kidding. I’ve been making pancakes for a while now and I think I’ve found the secret combo of ingredients to produce a light fluffy vehicle for all that butter and syrupy goodness. Probably the most important thing you need is an electric griddle (especially if you’re slinging flapjacks for a crowd). It’s big, non-stick, and cooks evenly. Combine all of your dry ingredients in a large bowl. In a smaller bowl, whisk the egg and milk together. It’s best if the milk and the egg are close to room temperature but this isn’t a deal breaker. Now SLOWLY add your melted butter to the milk/egg mixture while you whisk, this will prevent bad things from happening (aka scrambled egg). Make a well in the center of your dry ingredient bowl and pour the liquid in. Use a whisk to incorporate everything but for GOD’S SAKE don’t over mix it or those pancakes will turn on you, a few lumps is perfectly fine (say it with me now). Once the batter is all dun mixed up I let it sit for a good 5 minutes before I use it, I don’t know why I do this but I do know the saying “if it ain’t broke don’t fix it” and I comply with all sayings. This is a good time to get your griddle nice and hot! But not too hot, like 300°F is good. 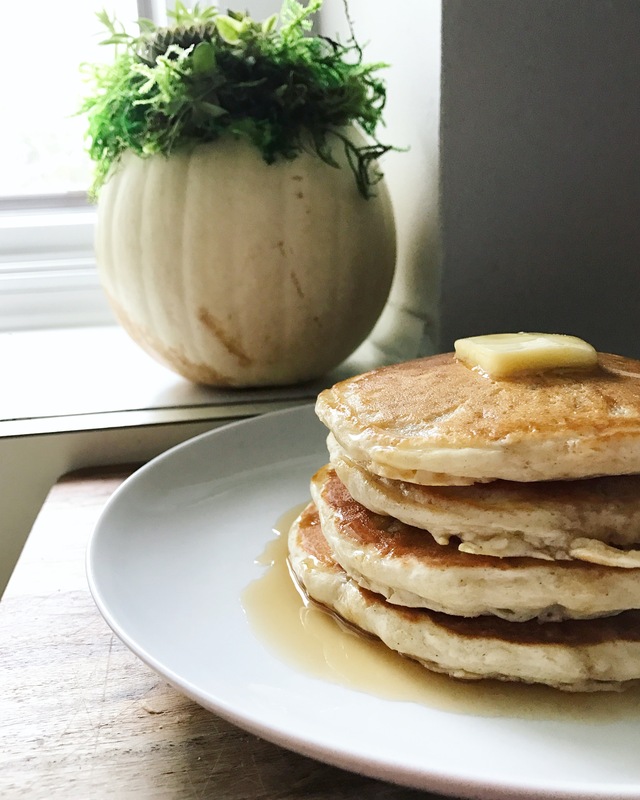 If you’re making your pancakes on the stove I would suggest a cast iron skillet on medium low heat and an extra 3 hours to make all of the pancakes, kidding! Just an extra 2 hours. Use a 1/2 cup measuring device (I needed another word for cup) to ladle the batter onto the griddle, you can use more or less depending on the size you desire. I desire to have six fit on my griddle so I plan accordingly. They should take about 4 minutes a side but check them to make sure they’re ready to flip before you commit. 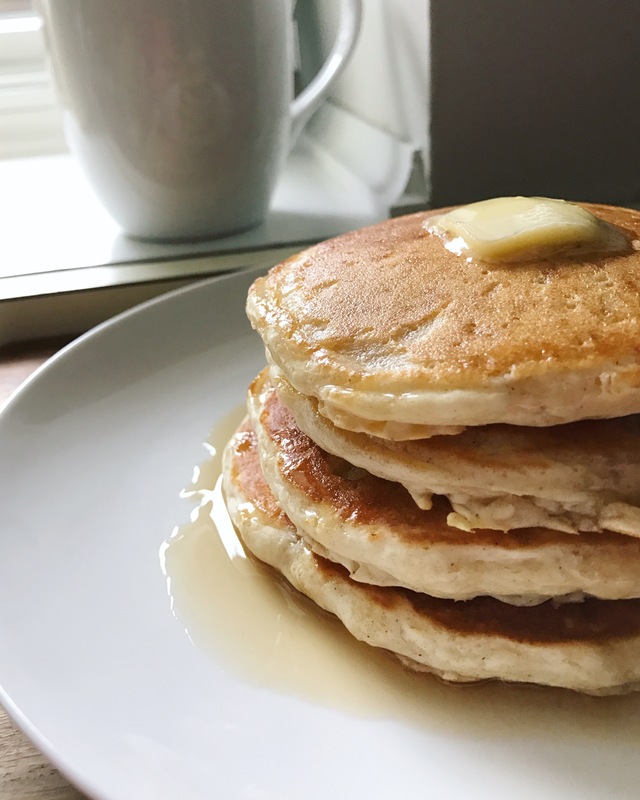 Serve with good butter and REAL maple syrup, your pancakes are too special for the fake stuff…yea, I’m talkin’ bout you Mrs. Butterworth and Aunt Jemima! 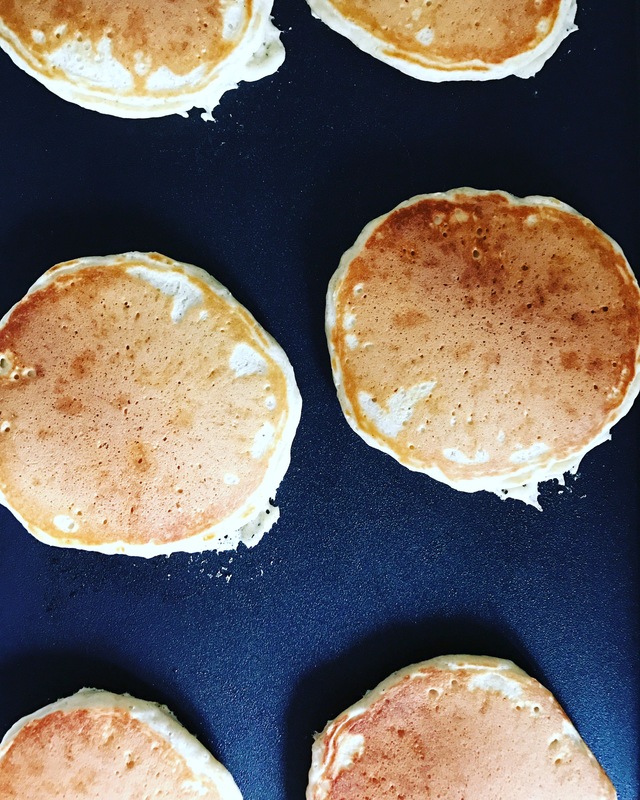 Look at those beauties…and the best part is that I get at least an hour of quiet time after I make these pancakes because my boys are too full to beat each other up. Hashtag Bliss. Does anyone buy bottled salad dressing anymore? If the answer is “yes” I can’t help but feel compelled to shake my fists in the air and demand WHY? Have you looked on the back of a salad dressing label lately? That should be reason enough to make your own but I will give you another reason, it takes like 2 seconds and you’ll know what’s in it! (wait, that’s two more reasons I think)…you get it. Here is my go to salad dressing recipe, it’s a sweeter vinaigrette but can be adjusted easily to your taste preferences. I suggest making the dressing in a large liquid measuring cup so that you can just refer to the measurements on the cup while you add ingredients (although you might need some basic addition skills to do this). Combine everything together and whisk really well…done. I also like to make this dressing in a mason jar so that I can pop the lid on and shake it till I make it. It will last in the fridge for weeks and you can always double or halve the recipe depending on your needs. It also serves as a great marinade for chicken or beef, there’s really nothing it can’t do.